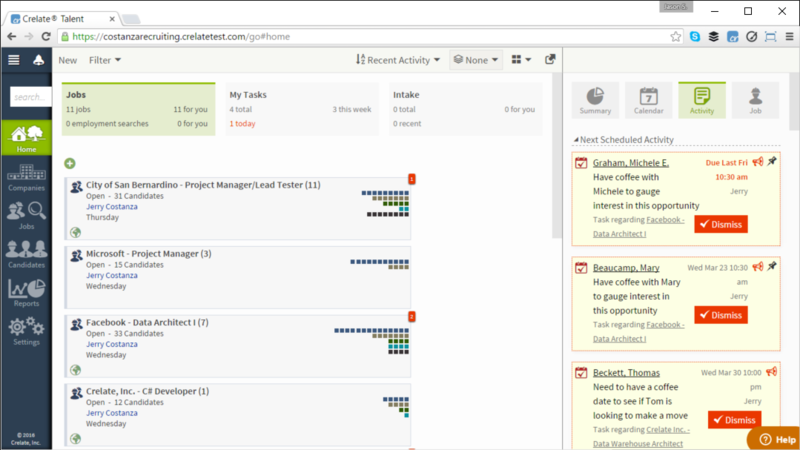 Crelate Talent Review: "Crelate: Good for Basics"
Crelate is used by the executive search department, a 3-person team. We use it to house all of our candidates - potential and active - for the different roles we're looking to fill. We also use it to sort potential candidates into other groups, such as bankers or people who may have connections to Boston. We have their contact info there, their resumes, their interviewing status, notes we take on their backgrounds...everything we need on a candidate. We also keep track of their gender and race, as we are focused on increasing the number of female and otherwise underrepresented minorities in roles they have not traditionally been able to hold. This isn't a self-explanatory platform - you have to dig around a while before you figure out how to use some features, like the filtering of contacts, for example. There's a place that you'd think you filter, but that actually changes the contacts list instead. It often crashes and you have to sign out and sign back in for it to work again. Crelate is wonderful if you just want basic candidate tracking. It does everything it needs to do on that front - let you track the stages the candidate is in, have their resume and contact info ready, as well as their current position. The extension that allows you to mine from LinkedIn is also very handy and I use it daily. It works very well. 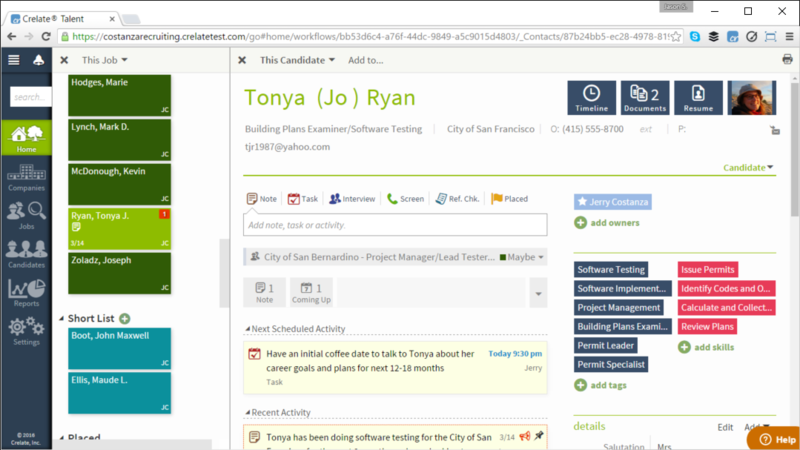 You can easily add candidates to open opportunities and if you are organized, Crelate can be really helpful. If you don't want to put in a lot of the legwork, Crelate may not be for you. There is a lot of manual work that you must do to make Crelate functional - all tagging, any information that doesn't come in through the resume or LinkedIn (and you have to double check because, like with anything, there are sometimes errors in the import). It's not a very streamlined platform and not intuitive. But as I said, if you need a basic ATS, it'll do the job. Crelate Talent Review: "Easy to use! Designed for the recruiter." As a solo recruiter, I use Crelate Talent to manage the operations of my recruiting business from business development through placement. 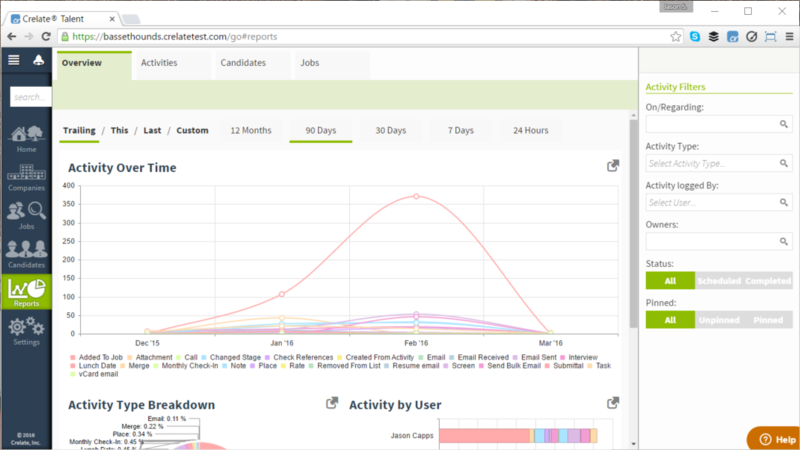 It allows me to track my jobs, candidate and biz dev funnels extremely well. 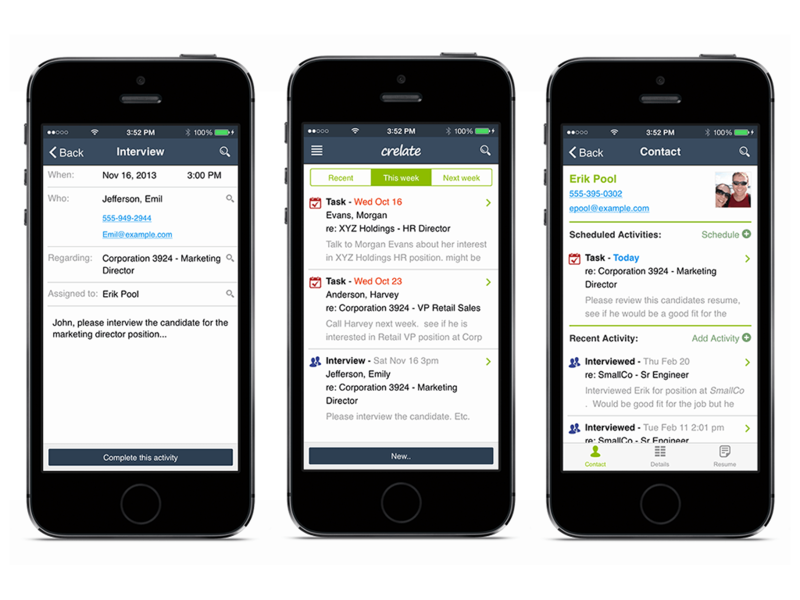 Very well integrated with email, calendaring and MS Word. Drag and Drop - easy to move candidates through the recruitment process. Intuitive- easy to learn and manage. Interfaces well with emailing and texting. Built in support for MS Word. Easy to cross reference contact records using "@" symbol - very nice feature. 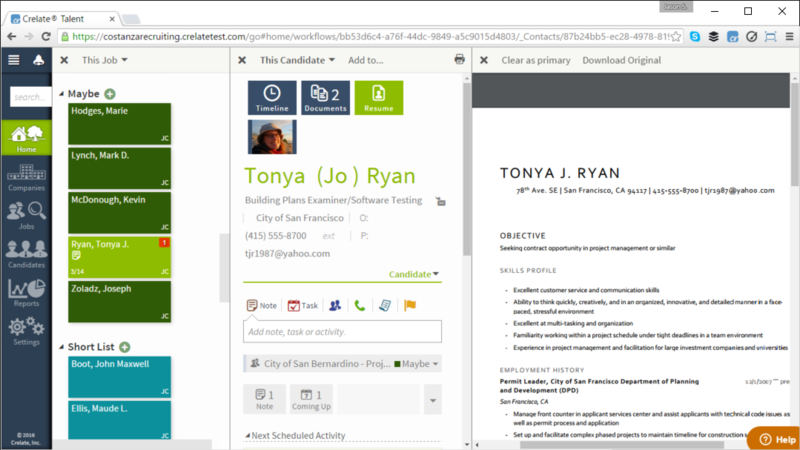 Easy to import resumes and contacts through multiple solutions. Would be better to incorporate texting feature directly to my existing phone number, rather than use a separate system. Sending calendar invites is a little hard to remember how to do - could be a bit more intuitive. Need faster support - online chat would be great. Click to dial works well, but would be nice to "record" the event in the contact record. Supports the entire business and recruiting function for a single or multi-user environment. Haven't used it for staffing, so I cannot comment on that aspect. Crelate Talent Review: "Crelate - a great basic"
We initially used Crelate as our main applicant tracking system (ATS) but are now also able to use it as a customer relationship management (CRM) tool. The recruiting side of the business uses it more heavily, though it has such great functionality that we're actually able to spread it out across different departments within the entire organization. Customizability - I like being able to have control over what fields I can have and the order that they appear in. Crelate allows me to implement a system / logic that makes sense with my process. Extension - Absolutely love the Chrome extension as it's able to effectively parse most of the information I need. Customer Service - The support staff is incredible and are always willing to onboard new users / hop on a call to walk through any new issues or updates. Aesthetics - Although it works, I think there's definitely room in the future to explore how they could improve optics. Search - There's many different ways in which you can search through all of the contacts on Crelate, but it's not too intuitive (especially for new users). Integration - I'd love to see Crelate integrate with other tools I use (e.g., Mixmax) as it would greatly improve productivity. 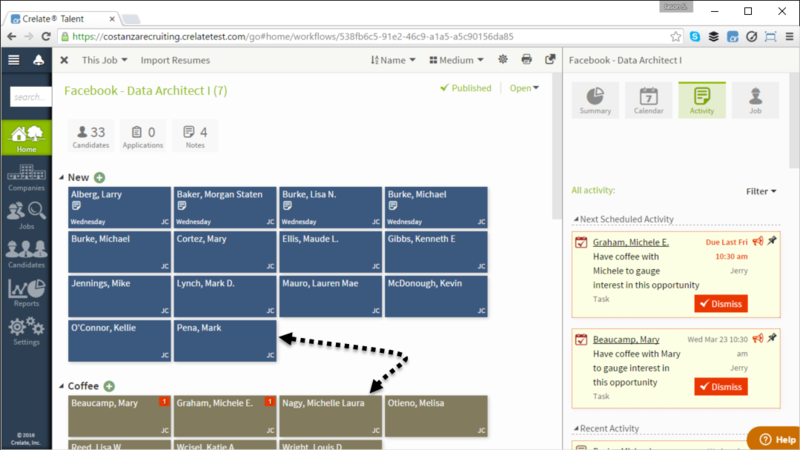 Crelate is a good CRM/ATS as it's functional, easy to adapt, and simple to integrate within the workflow. We primarily use it to track communications with candidates, though not as much for the client-side. In terms of being an ATS, I don't really have any other products to compare it to so my feelings are positive. It's less appropriate, I would think, if you are using a suite of productivity tools as I'm not sure that it really integrates well with many things. There are definitely some improvements to be made but, at its core, it is an effective tool that is necessary for the work that we do. Crelate Talent is a cloud-based ATS developed by Crelate in Bethesda, Maryland. This product offers the full suite of features typical of applicant tracking systems: batch or mass communication with potential candidates via multiple channels such as email or by leveraging its integration with social networking sites (e.g. LinkedIn) and commonly used applications (e.g. Outlook), instantaneous posting to multiple job boards, a branded job page, resume parsing, and a unique, approachable interface featuring colorful drag and drop tiles. Talent management is the platform's emphasis, thus detailed accounts of candidates and interactions with them add a personal touch to records. Generally this particular platform is sought and used by smaller companies. The Starter level program is relatively inexpensive and covers the basics, and the Professional level contains features typical of most ATS. A Premium level can be tailored to the needs of larger companies than the platform's typical users, and comes with unlimited training and support for implementation. A free trial is available, as well as a live demonstration. Volume and commitment pricing discounts are available.